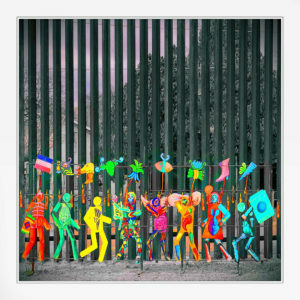 Art installation by Mexico City art students at Nogales, Arizona border. (c) 2015-2019. Photo by Nic Provenzo. First Unitarian’s Immigrant Justice Task Force was organized in 2017 in response to our nation’s heightened anti-immigrant climate. We function under the purview of the Social Justice Council. Educating the First Unitarian Congregation and encouraging the Congregation to take action that will provide safety and relieve suffering for those targeted by hatred, discrimination and unjust policies based on their immigration status. Building Relationships: Developing strong working relationships with the immigrant community, advocacy groups, and other congregations and organizations that are working for immigrant justice. Congregational Education: Providing opportunities for our congregation to learn about the legal, moral and practical implications of current immigration policies and practices. Congregational Engagement: Providing the congregation with information about opportunities for immigrant justice work. Consideration of providing Physical Sanctuary: Leading congregational considerations of providing physical Sanctuary for immigrants in danger of deportation by housing them at our church. Outreach to First Unitarian Immigrant Neighbors: Seeking ways for the congregation to welcome, support and provide access to services for our local immigrant neighbors. Financial Support: Using the funds available to the Task Force for activities that support the mission of the Task Force. For more information contact Marilyn Holscher at mrholsch@gmail.com.